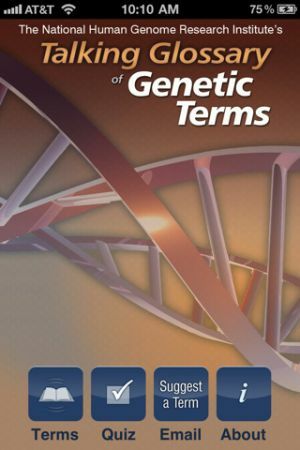 The Talking Glossary of Genetic Terms features more than 250 common genetic terms pronounced and explained in an easy-to-understand way by leading scientists and professionals at the National Human Genome Research Institute (NHGRI). Each term has a short written definition. Each term features the voice of an expert spontaneously explaining the term in their own words, typically in less than a minute � with no reading allowed. Together these two explanations help non-scientists better understand common genetic terms found in grade school textbooks, news stories and movies, and through interactions with medical professionals. All terms are pronounced even if they are as simple as �gene.� Nearly all have expertly crafted color illustrations. 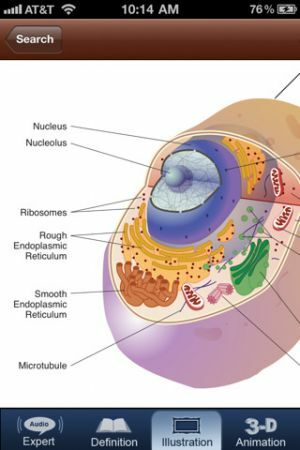 Many have exciting 3D animations including common terms such as gene, chromosome, nucleus, mitochondria, golgi body, cell, ACGT and more. 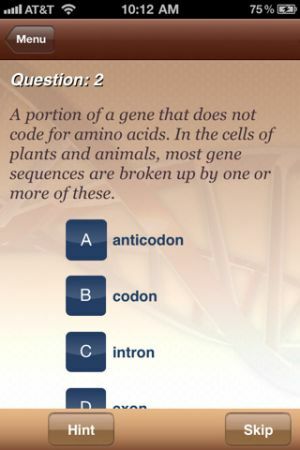 The �Test Your Gene IQ� quiz automatically serves up a definition and asks you to choose the correct term name from a list. This ten-question quiz is random and never the same, and is a fun way to challenge your friends or prepare for a classroom quiz. 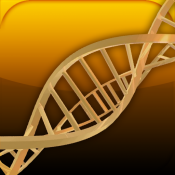 -Original high-quality �3D animations� for many terms. 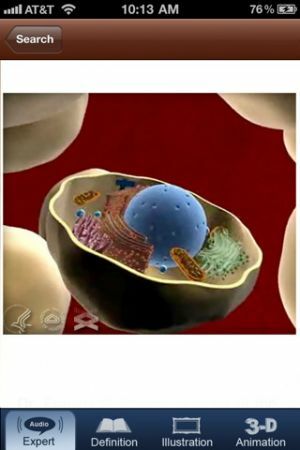 -Terms chosen are from 7th � 12th grade biology texts, commonly heard in the media, or used by medical professionals. -�Share a Term With a Friend�, or �Suggest a Term� functions. General performance enhancements and a few minor content fixes. 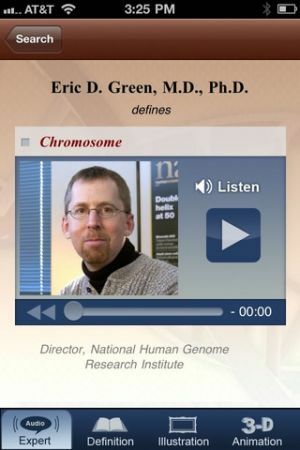 Estupenda app elaborada por el National Human Genome Research Institute (NHGRI) con textox, voz en off de cient�ficos e im�genes y videos sobre m�ltiples t�rminos (glosario), relacionados con la gen�tica para que los alumnos descubran la gen�tica. presenta tambi�n unz zona de preguntas.